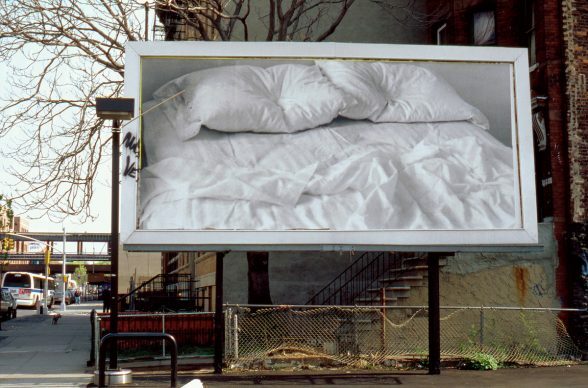 Felix González-Torres, Untitled [Billboard of an Empty Bed] 1991. Room 212 of the Institute for Research in the Humanities, Located in the University Club. Events made possible thanks to the financial support of the Anonymous Fund and LACIS. We are also grateful for the support of the Departments of Art, Art History and Spanish and Portuguese. There is a tendency in visual culture theory to still abide – probably inadvertently – by Marshall McLuhan’s eventful phrase (1962, 1967) “The medium is the message,” later rephrased as “The medium is the massage,” which proposes that the medium itself will distort “reality” by composing and displaying images meant to force biased contents onto the viewer. I will challenge this persistent idea of a passive viewer by exploring how landscapes and cityscapes – where the subject’s changing position and point of view create an equally changing scene – may lead the viewer to restate meaning and form beyond the visual, thus defying deliberate contents, unleashing the freedom to see in a more complex sensory context, and redefining their visual culture. When discussing the landscape experience, I will focus on anthropologist David Le Breton’s Éloge de la marche (2000) and Tacita Dean’s Place (2005); and, for the cityscape experience, artist Félix González-Torres Untitled [The empty bed] (1991) billboards posted on several Manhattan buildings, and Michel de Certeau’s 1995 essay Practices of Space. This workshop is designed as a presentation and conversation about contemporary Puerto Rican art, with special attention devoted to the creation and installation processes. Puerto Rican Arts has become the rage. In the last 5 years, many of our artists have been featured in solo and group shows in New York City, Chicago, Miami, Los Angeles, Las Palmas (Canary Islands), Mexico City, Havana, London, Berlin, Milan, Madrid, Montreal and Sao Paulo, among other venues. The main reason for this sudden applause is the great diversity of subject matter, materials, approaches, object theory, social commitment, and siting; and the way they transform tradition into something completely wayward and unexpected. From a renewed interest in land art, to the making of gigantic grattages and frottages; from allegorical art to down-to-earth political commentary, our artists are taking art by storm. The painter Arnaldo Roche has taken the self-portrait to a new level. Land artist Dhara Rivera has renewed that concept in a lyrical vein. Jeannette Betancourt has focused on the plight of Puerto Ricans subjected to a monstrous fiscal debt forced upon us but never audited. Ramón Rivera Beltrán is retelling our history as something no longer written in stone… but in brittle concrete. Humor and sadness, anger and beauty are shared by these four artists. Come and share with us a great conversation about contemporary Puerto Rican art! Dr. Lilliana Ramos Collado teaches architecture theory/history at the University of Puerto Rico in Río Piedras. She has published three poetry books, Útimos poemas de la rosa(Erizo Editorial, 2013) being the latest, and several books on art theory, history and criticism, the latest being Puerto Rico: Gateway to Landscape (2014). Ramos has published widely on art, literature, architecture and heritage in scholarly and non-scholarly journals and magazines, was Puerto Rico Museum of Contemporary Art head curator, and also Executive Director of the Institute of Puerto Rican Culture, a position equivalent to Minister of Culture. Her latest book on architecture and heritage, La patria en ruinas: siete visitas a la catástrofe, is due next May.